A talk show with director Mako Kamitsuna with her film, “Katya”. “Katya” and “She, Who Excels in Solitude” were shown at NTT CRED Hall 2 at 19:00pm on November 21st. 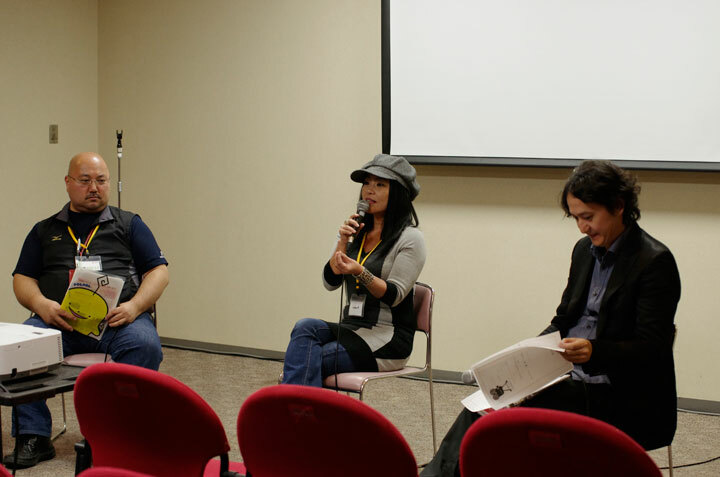 After screening, Ms. Mako Kamitsuna who was the director, playwright, and editor of both films, Mr. Taro Sonoda who was a producer in Hiroshima Home Television, and Mr. Hideyuki Tokigawa who was a filmmaker were invited to the talk show. When she was asked about her future, she said, “I want to make a film in Hiroshima, especially involving my family who live in Hiroshima. My grandfather opened his clinic in 1949, so I want to depict the recovery history of Hiroshima from his view. I want to depict Hiroshima history that only Hiroshima people can tell. It is a privilege of a director who is from Hiroshima. But first, I have to edit the documentary of X JAPAN (Japanese famous rock band) when I go back to Los Angeles.” She mentioned the edition of the documentary that will be shown before X JAPAN concert on March next year. She must be very busy.